Mothers tend to put everyone ahead of themselves. You are very important part of the Wedding Party. Don't wait to choose your dress and have to settle. Be sure to find your Mother's Dress as soon as you bride has found her gown. When you have your gown found or ordered you can be strees free instead of waiting and having to settle at the last moment, as Mother's dresses do take up to 3 months time to order and get in. Then you can put your undivided attention on planning the rest of the wedding. the most Important Women at any wedding. All eyes will be on you, and we want you to look your best. Important Hostess of the year. your daughter's most important day. Finding a beautiful dress is a great way to show her how much you care. 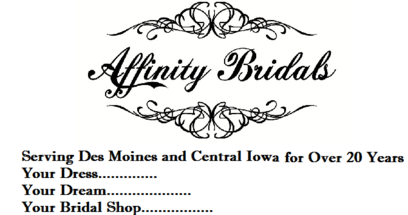 Always be beautiful with a Wedding Gown from Affinity Bridals!